If you like USB devices and funny t-shirts then this is the shirt you want. On the t-shirt, you can see a USB flash drive that is shaped like a fish and as you can see the USB connector normally hides in the head of the fish. And as fish are not that smart the flash drive only has a capacity of 1kb. Below the flash drive, it says “Fish Stick” and that is fitting as it is a fish shaped USB stick. You can get this fun t-shirt in styles for both men and women and it is made from 100% cotton and available in sizes Small – 6XL. 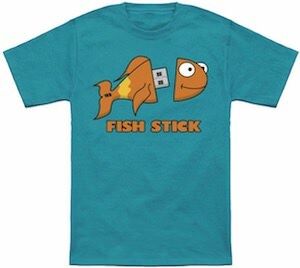 Show the world a funny shirt so wear this Flash Drive Fish Stick T-Shirt. This is fun and functional USB HUB. 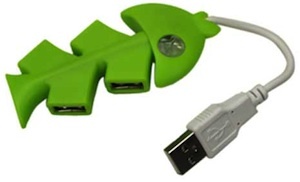 A USB HUB that looks like a fish bone and that all in green. Not only does this hub look special it also is. The ports are build in to the bones of the fish and that means that they have a different angel and distance so that they will not interfere with each other. No you can easily use all 4 ports without having to worry about the wires be in each others way. The USB HUB supports up to USB 2.0 and of course this will deliver a great speed. Go have a closer look at this Green Fish Bone Hi-Speed 4 Port USB HUB.